What are those long red and black bugs in the garden? Are they 'good' bugs? Or are they 'bad' bugs? Why are they only on the Milkweed? 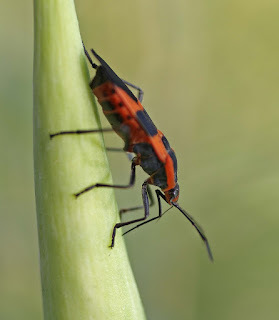 If you have spotted this one, then you have what is known as the Oncopeltus fasciatus or the Large Milkweed Bug. There are two types of Milkweed Bugs that love to hang out on the Milkweed plants: the Large Large Milkweed Bug (let's call it the LMB for short) and the Small Milkweed Bug (we'll call that one the SMB for short). Both feed on the seeds of the Milkweed plants. They are in the True Bug (Hemiptera) order of bugs and the Seed Bug (Lygaeidae) family. Now, the LMB's and SMB's life-cycle is an interesting one. Why? Well, like the Ladybug, they do not go through complete metamorphosis when developing from egg to adult. The 'babies' or nymphs look kind of like the adults but don't have any wings nor any reproductive organs. They also lack the black spots initially (the spots show up later as the nymphs get older). 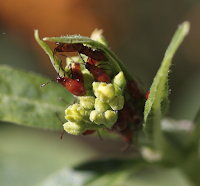 Females oviposit (lay eggs) in small areas/crevices between the pods on the Milkweed plant. She will oviposit about 30 eggs a day and can lay up to 2000 total in her lifetime (lifespan is about one month). 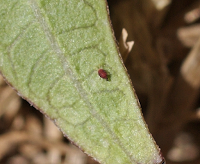 In about four days (when the temperature is warm, around the 80s or so) the bright-coloured nymph ('baby') hatches. Like the butterfly larvae, LMB and SMB nymphs grow by a series of molts (shedding of skin) and the stages are called instars. Each instar lasts approximately a week in length. As they molt and become larger in size, they slowly approach the appearance of the adult Milkweed Bug. As they grow, the LMB and SMB nymphs are rather interesting in their behaviour. 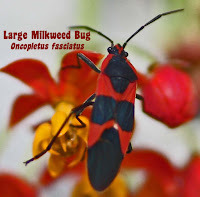 They are gregarious and can often be seen gathered together in one spot on a Milkweed plant…and, if the plant is touched or disturbed, then all of these brilliantly-coloured critters scatter! Because the Milkweed Bugs feed on Milkweed, these insects are fairly safe from predators. Why? Just like the Monarch butterfly, whose larvae feed on Milkweed, which makes the adult also safe from most predators, the chemicals in the Milkweed latex (sap) is toxic. The latex contains cardiac glycosides, a type of cardenolide. If a predator eats one of these bugs, the predator will more than likely vomit. The same is true if your dog was to eat one. Note: If your dog ate a LOT of Milkweed Bugs, it could be most dangerous! The cardiac glycosides/cardenolides are cardiac arresters or a type of steroid that can stop the heart. So, please keep an eye on your pet if it is one that likes to ingest garden insects. Now, here's the question: Are these 'good' bugs or 'bad' bugs? It depends upon what you consider to be good or bad. 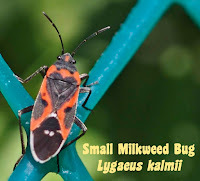 Since the Milkweed Bugs are seed and sap-suckers, and since Milkweed is an important host plant in MY garden, I consider them a 'bad' bug. This means, I am going to prefer that they do NOT live in my garden. Others may disagree with me but I've found that having them in the garden, my Asclepias' seed pods have become deformed and I am unable to gather the seeds that I want. Here's a Large Milkweed Bug (Oncopletus fasciatus) sucking up what he can from a seed pod! A-ha! Caught in the act! What do I do then when I come upon these critters? Since they don't bite or sting, I squish 'em. That is the easiest method for ridding the Milkweed of them. If a whole 'herd' is gathered on a seed pod (usually the little nymphs), then I take a paper towel and wrap it around the pod to gather them up to squish. The little ones do tend to 'run' quite fast! The adults can fly, so keep this in mind as well. Make your own decision on what to do when spotting the LMB and SMB in your garden.